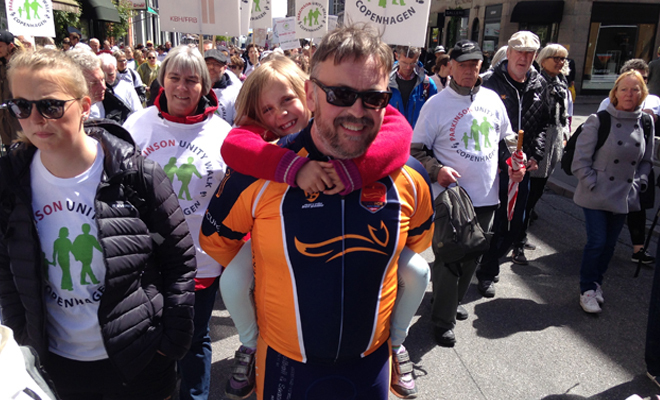 Copenhageners will welcome walkers and cyclists from all over Scandinavia, Europe and the US for the 5th annual Unity Walk on 28 May, which coincides with the three-stage Parkinson Denmark 2016 bike tour from 26-28 May. Like the flagship Unity Walk in New York’s Central Park, the Copenhagen Parkinson Unity Walk aims to increase public awareness of the condition, as well as emphasising the importance of exercise for the wellbeing of people living with Parkinson’s. The two-mile walk, led by patron Countess Alexandra and association ambassadors, will start at the Danish parliament buildings at Christiansborg Palace and finishes at Kings Garden. More than 200 cyclists on the Team Fox Parkinson Denmark 2016 tour are expected to complete their tour just in time to join the hundreds of people taking part in the walk at Christiansborg Palace. The ride comprises three stages beginning in Sinatur Hotel Sixtus in Middelfart, where they will be taken by bus to Næstved and ride to Sinatur Hotel Frederiksdal in Lyngby. The final leg will then take them to Copenhagen. All Team Fox riders will be raising funds for Parkinson’s research by taking part in the race.